SAN BERNARDINO, Calif. /California Newswire/ — The San Bernardino County Workforce Investment Board surveyed 1,400 local Calif. businesses to identify trends in future hiring and growth. The results indicated that companies are recovering and beginning to hire in the County's top demand industries: manufacturing, health care, transportation and logistics, energy and utilities, and construction. "The Workforce Investment Board's business services team meets regularly with employers both to offer no cost services to support their needs and to gather information on employment trends," says Brad Gates, Deputy Director for Business Services, Workforce Investment Board. "We are seeing continual upward trends in the County, especially in logistics and transportation and manufacturing. As more industries regain their footing and start hiring, the County's economy will continue to gain momentum and grow." A recent comparison of data from third quarter 2011 and third quarter 2012 showed that both the transportation and logistics and the manufacturing sectors are recovering, with many employers planning to hire. In transportation and logistics, 33 percent of the businesses surveyed in the third quarter reported that their sales are increasing, and zero percent of businesses answered that their sales are declining. This is a significant increase compared to the third quarter of 2011, when only 26 percent reported increasing sales and 14 percent reported declining. The Workforce Investment Board has identified transportation and logistics as an in demand employment sector. "With such a boom in transportation and logistics, it only makes sense to for us to strategically focus our limited resources in this and the other growing industries. We want to work with the County's competitive advantages to create a trained and skilled workforce that will continue to build growing industry sectors," states Sandy Harmsen, Executive Director of the Workforce Investment Board. The manufacturing industry shows a similar trend; sales and employment have increased significantly. Thirty-nine percent of employers surveyed reported that sales are increasing and 41 percent of employers reported that employment trends are increasing, this industry is growing quickly. Along with the rise of these business sectors, a recent survey also shows that the local unemployment rate is inching down each month. "The County's economy is starting to pick up momentum thanks to significant growth in our major industries. The continued support of our Workforce Investment Board and its business services team will keep our economy in a positive direction," said Chair Janice Rutherford, County of San Bernardino Second District Supervisor. 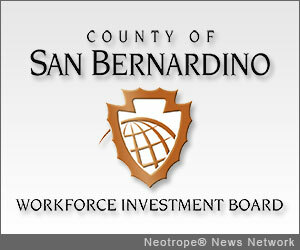 Services such as process improvement consulting, employee training, On-the-Job training, and recruitment are available at no cost to businesses in San Bernardino County through the Workforce Investment Board. For information on upcoming training classes, contact the local Employment Resource Center or call (800) 451-JOBS; visit www.csb-win.org . The WIB, through the County of San Bernardino's Economic Development Agency and Workforce Development Department, operates the County of San Bernardino's Employment Resource Centers (ERCs) and Business Resource Centers (BRCs). The ERCs provide individuals with job training, placement and the tools to strengthen their skills to achieve a higher quality of life. The BRCs support and provide services to the County's businesses including employee recruitment. Employers and job seekers who are interested in the Workforce Investment Board programs may call: (800) 451-JOBS or visit http://www.csb-win.org/ .